These are endlessly, intensely expressive animals. This is seen not only in their colors, but also their body arrangements and patterns (see below, a different individual from the same time). What are they doing with these kaleidoscopic changes, and why did these tendencies evolve? The standard story, as I understand it, is that camouflage came first in cephalopod skin evolution. Then signaling followed, in some species. And in addition (or as a special case), there are displays intended purely to startle – these are called “deimatic” displays. This last category might cover a lot of cases, including attempts to startle me. The top photo, I suspect, might be like that. 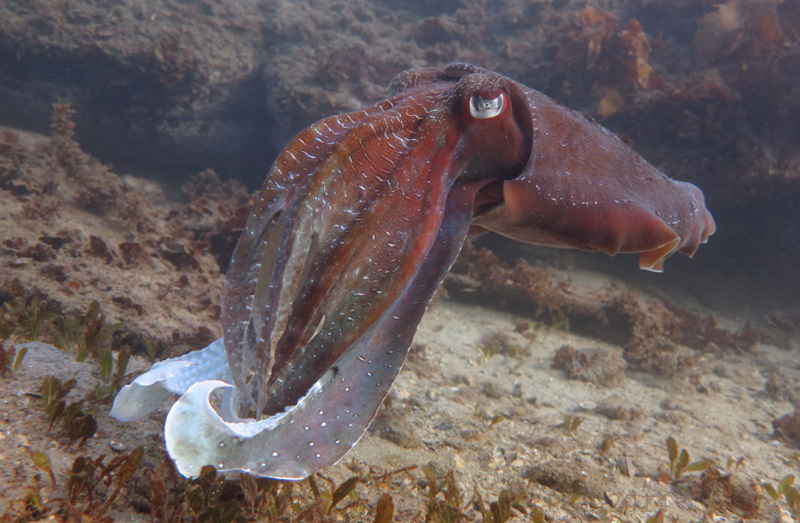 The cuttlefish was roving around and producing a fair number of colors, but when it came round to face me, there was more intensity. However, I think that some of what’s happening is not like this. Watching these animals for some years now, I’ve started to take seriously a hypothesis about what’s going on. The hypothesis is that a lot of these color changes are without function, and are an inadvertent reflection of what is going on inside. Evolution wired these animals’ brains to their skin to perform definite functions – camouflage, signaling, startle. But once the wiring is there, a lot of inner activity is just reflected, expressed on the skin, without this being directed to anyone. One reason I believe this is the fact that I’ve seen many cases now where a series of color changes did not seem to be aimed at me, or at any other animal around. The color-changing animal was facing away, alone, and in good cover. I suspect that the yoga-like contortions, the bendings and stretchings of the whole body, do always occur for a more definite physiological reason, baffling though they might be to watch. But much of the color change, I conjecture, is inadvertent in quite a strong sense. I think there’s just a lot going on inside these animals, a lot of inner activity, and compared to other animals, a larger proportion of it is made visible, because of the neural wiring that’s in place. The color changes are neither communicative nor private – the producer does not see them, and cannot make private use of them. They are just emitted, and must have various consequences, but none adverse enough for natural selection to start constraining the behavior in a tighter way. 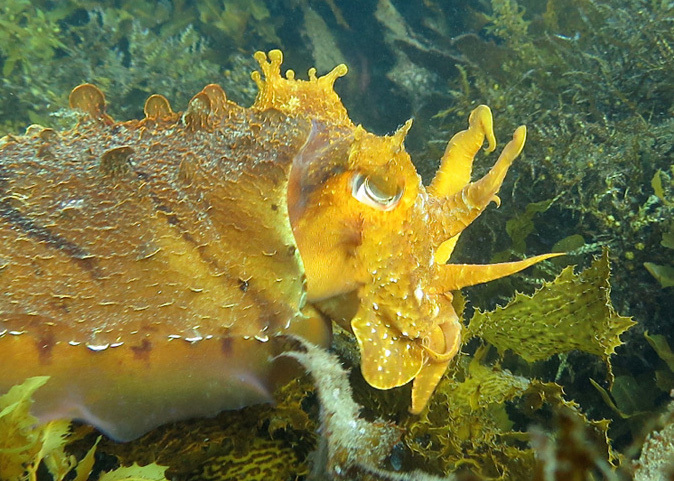 I saw these cuttlefish in May and June and then they were gone. The winter mating season off the coast here in Sydney seemed pretty quiet. The animals come and go quite unpredictably. This apparent unpredictability is part of a recent piece of good news. 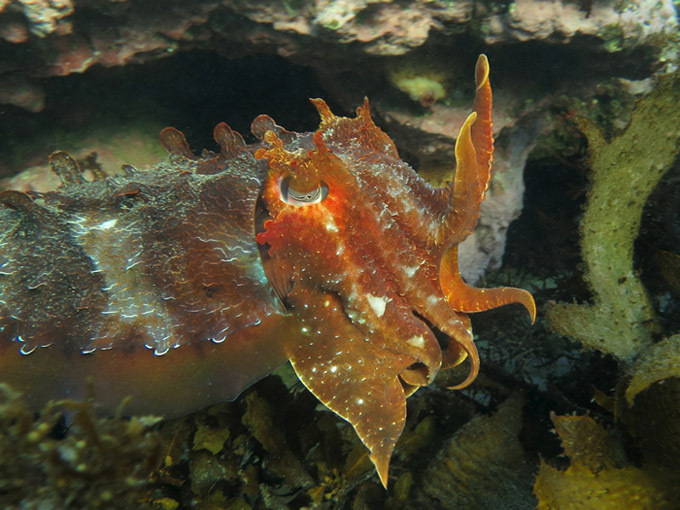 Over the last two years it had seemed that the astonishing annual mating aggregation of Giant Cuttlefish at Whyalla, South Australia, had just about ceased. But this year, very much against expectations, the animals came back, on their old schedule, in many thousands. No one knows why, or where they’ve been. 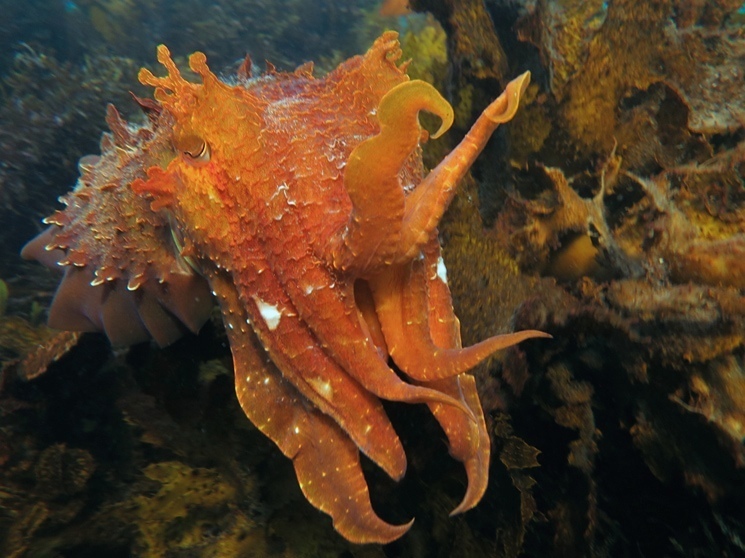 This entry was posted in Cephalopods, Nervous Systems and tagged cephalopods, communication. Bookmark the permalink. … but the seals are following and eating them : (. I am beginning to think there are simple communication aspects that are universally understood except to humans. Recently Roy posted an unusual pattern displayed by a blue ring. The standard blue rings were displayed but on the side where the mantis shrimp was viewable (in another aquarium), it displayed a dark stripe in addition to the blue rings. Clearly it was signaling something to the mantis and expected it to understand. I have been watching my own S. bandensis and thinking about communications. One that is the only aggressive animal always turns dark brown flails it arms in a crisscrossed pattern when it sees me. It does not disappear and it does not attack (me) but I feel it expects me to understand … something. Food, or “feed me, NOW” is the most obvious answer but I am not sold on that as it would seem all of them would perform the ritual if this was the case. Perhaps it means, “I am the meanest cuttle in the litter” (it is not the biggest). Maybe it is like a male swagger, different for each species but somewhat universally identifiable. Male swagger does seem highly plausible. 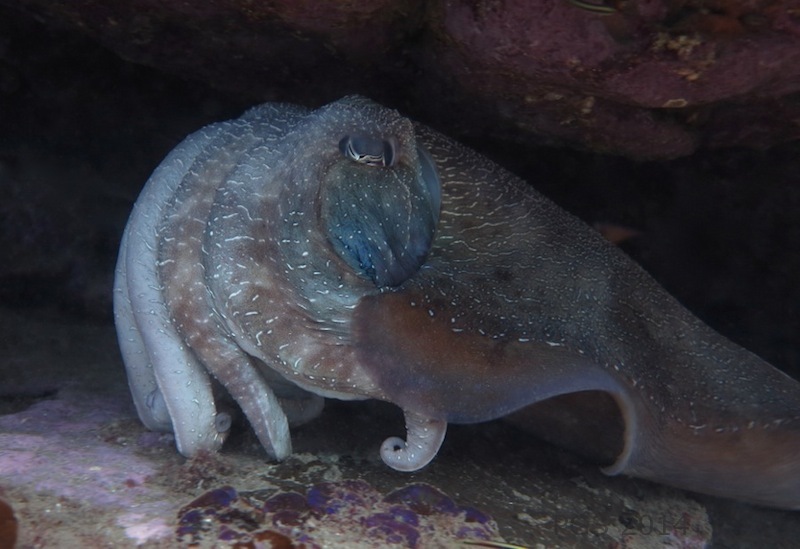 Roy’s octopus photos are always remarkable.